The early filings in preparation for today's trial between Apple and Samsung showed the Koreans are building a theory that the initial iPhone design is inspired by a Sony designer daydreamings and concepts. The ideas were so compelling for Apple's industrial designer Shin Nishibori, that he put together a drawing and a mockup clearly labeled Sony, to reveal the source of his inspiration, and then Jony, as a tribute to Apple's chief designer Sir Jony Ive. Samsung no doubt intends to distract the jury from its own copying by suggesting that Apple, too, has copied a competitor. The evidence is not admissible to prove this point, and Samsung’s attempt to proffer it on this basis should be rejected under Rules 402 and 403. Mr. Nishibori’s design and Mr. Fadell’s email had no influence on the development of the iPhone’s design, and to suggest otherwise is a waste of the jury’s precious time. 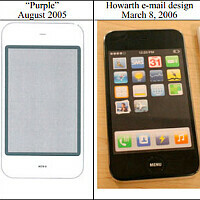 During development of the iPhone, Apple’s industrial designers created numerous concepts, including this one dated August 2005—a rectangular shaped phone with evenly rounded corners, a band running around the midpoint of its body, a centered display on the front face, a menu button centered below the screen, and a speaker slot centered above the screen. We learned yesterday that Shin Nishibori has seemingly quit Apple this month, doesn't want to testify for Samsung, and, according to his lawyers, is recovering from a health problem in Hawaii. It is not the first time Nishibori is dodging deposition as a Samsung-summoned witness - the Koreans had to show the court some of his tweets about work trips and 10K marathons participation to fight the claim that he is on a leave of absence and can't testify. The plot thickens and today all eyes will be on San Jose's District Court for the start of tech trial of the century. wendy, if you really believe all 4 devices look identical, then you should make an appointment with your eye-doctor. other than button placement on the sony original design, those are extremely identical. maybe you iNuts should take off your fruit glasses and have a look-see. hmm? I've always wondered why you are such a fanboy ardent. You dont even have an iphone. You have a cheap POS on a cheap prepaid carrier. Do you daydream about the day you get to own an iphone? What is it that keeps you going? geesh. > other than button placement on the sony original design, those are extremely identical. remix, do you know why you are the resident village idiot of PA? If there is a difference, then the two items are not identical, they are similar. Identical means "similar or alike in every way" (soure:http://dictionary.reference.com/browse/identical) In English, identical means the items are clones of each other -- the Nishibori prototype is "SIMILAR" but not "IDENTICAL" to the first two prototypes. remix, I am not responsible if you have a sixth-grade understanding of English. aww.. da poor wittle guy doesnt like being called out eh? aww. "other than" ; with exception to/ not including. "other than button placement on the sony original design, those are extremely identical" or "with exception to the button placement on the sony original design, those are extremely similar or alike in every way". Id say my original statement fits ,and you sir are the RVI you keep talking about. remixfa. Not only are you the undisputed resident village idiot on PA, you are also a bloviator and a SORE LOSER!! If you can't see that Shin Nishibori's prototype has a sizeable dial on the upper right-hand side, than you are like wendygarret in that both of you guys need to have your eyes examined. The Nishibori design is not symmetrical and this is obvious and self-evident. "other than button placement on the sony original design, those are extremely identical." If you missed the dial-like feature the first time and you also missed it the second time, then you nearly blind as a bat. Also, it wasn't a Sony "design" so learn to use English correctly like the rest of us. Please stop being a sore loser -- it's annoying. If Apple wins.. what's in it for you? Will Android become unprofitable? No. Will Samsung's Android products become unprofitable? No. Will Android be forced to go a major redesign in order not to infringe on Apple patents? No. Will all Android users suddenly die from heart attack and Google's HQ will be demolished in a nuclear blast? No. Android is - and will continue to be the best, dominant, most widely used, free open source mobile operating system on the planet - and nothing - not even Apple with all it's billions can stop this. Much better devices, faster tech advances, and lower prices. And for that you should be thanking Apple as well for pushing smartphones to a whole new level. You should be thanking Android for pushing Apple to compete. If Android weren't around, the notification function of iOS would still consist of a beep when an e-mail was received. I remember the day that I saw for the first time an Iphone, it was the IPhone 3G. I was very impressive with the fancy UI, but then I realized that it didn't have multi-tasking! I was like, really? Why people call this a smart phone if it doesn't have multi-tasking? They should call fancy phone. You may ask why it was important to me, just because I had a Nokia E63 that already supported multi-tasking. Apple did innovated at the begging, but now days it only tries to follow the trend. Just some facts to prove my point. It doesn't have the best camera, Nokia has. It doesn't have the longest battery file, Motorola has. it doesn't have the fastest phone, I guess Samsung has. it doesn't have the best OS, I will no start a fight saying who has, but I'm sure it isn't iOS. it doesn't have the best voice assistance, Google has. it doesn't supports basic connectivity with others devices. (In real life this is call racism! Joking) it doesn't have the best price. it does have the best store with great apps and that retina display, but it isn't much to claim that it is the best smart phone out there. Android phones is doing a good job standing against the iPhone, so apple needs to accept the fact that they aren't alone, and bring the big innovations again. > Apple did innovated at the begging, but now days it only tries to follow the trend. You, like many people, committed an error in logic commonly known as "post hoc ergo propter hoc." We don't known what Apple has invented unless they commercialize it and show the world. So when people see it first in competing products, they automatically assume Apple is copying when in fact Apple is the innovator. We know Apple is the innovator because they are being awarded the patents to key technologies in the smart phone space. The iPad patent D504,889 was filed in March of 2004 and was the predecessor to the iPhone since it involved multi-touch. I would love to see Google patents from 2004 to 2006 regarding smartphones. I give Apple credit for the original iPhone. It was a game changer. Since then, they've rested on their laurels, and let the competition blast past them, and are pathetically trying to eliminate competition and stifle innovation via frivolous lawsuits. I also recognize that the original iPhone was nothing more than an extension of what came before. Apple stood on the shoulders of giants, and there's nothing wrong with that. But it's hypocritical to them deny others the same. Apple is still at the top of the food chain when it comes to smartphones. Blackberry is done, meego dead, windows has what 3% marketshare? Only one competitive with Apple is android. There's a handful of high end androids that are competitive with the iPhone. More than competitive. The top end Androids crush the iPhone in power, customization, and features. The last gen Android version is ahead ofthe as yet unreleased iOS 6. Spike stopped innovating after the original iPhone. They assumed the same defensive pair they did with Macs 30 years ago - sue to stand competition. The difference is back then we had sensible patent laws that forbids software patents. Ironically, Apple is today suing over ripped off elements just like they did then. Swipe to unlock and multitouch today, the Xerox GUI they stole back then. To the whole new price level. You forgot to mention pressure on Apple to INNOVATE since they can no longer suppress innovation. Droid_X_Doug, remember when you stated that ATT was going to engage in a hostile takeover of T-mobile. That was a really, really stupid comment. "...since [Apple] can no longer suppress innovation." is another classic D_x_D put foot into mouth disease. Please keep it up. Easy - I won't have to hear anymore about this whole trial BS. Sorry - no long dramatic response. Ummm. Poor little taco - if you are trying to argue that the 'Purple' design is dispositive, you are going to have to do a little better, as there were other similar designs out showing a rectangular device with a screen that takes up most of the area of the front of the device. 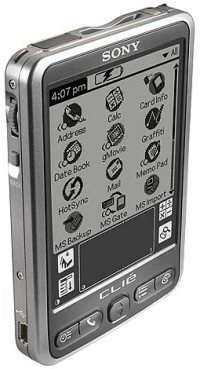 Palm was selling similar devices back in the late 1990 (1997?) timeframe, for example. Adding a telephone to the PDA concept is not going to get you to a sufficiently unique inventive effort to receive patent protection. nope.. nothing.. nothing at all.. squeaky clean witnesses regularly try to run from court hearings. Oh yeah??? http://www.schoolhousemuseum.org.au/Web%20Albums/Objects/slateboardandslatepencil.html http://www.sonyclie.org/images/newer/sl10.jpg I've owned the Sony P800 smartphone back in 2003/ 2004 after wishing my Viewsonic PDA had cellular internet connection instead of connecting it to my Motorola T720 through IR or cable. The Sony P900 is it's successor and shows that a lot of today's phones are just evolutionary due to people wanting to do more with their gadgets (like I did). I've also owned the Sony Clie NX-80 which had an awesome camera software. He has no point. This will be fandroids new talking point. They will ignore the fact that Apple has prototypes from before Sony and keep repeating that Apple ripped off Sony regardless of any evidence and reality. Just like they refuse to admit Apple revolutionized smartphones and android uses all the features Apple brought to market like pinch to zoom, multitouch, webkit browser etc. According to them Apple deserves zero credit for that because someone else would have done it anyway.